24 years ago, a certain Diego Armando Maradona, regarded by many as the one of the Greatest footballers, left Champion club Barcelona to play in the Italian Scudetto for mid-table Napoli. It turned out to be a master move for both player and club. With Maradona’s brilliance, the club who were struggling to stay in the top flight not long ago, won two Seria-A titles, a Copa Italia title and a UEFA Cup. Napoli easily beat clubs like Juventus, Bayern Munich and Vfb Stuttgart en route their first major European title. So at a time when Robson de Souza, better known as Robinho has completed a move from Real Madrid to English club, Manchester City, the similarities are quite obvious. Maradona was 24 when he moved to Napoli. Robinho is 24 as well. Barcelona were the Copa del Rey Champs when Maradona left. Real Madrid are the current defending La Liga Champions. And just like Napoli at that time, Manchester City are also strugglers with not many titles to their credit. Both Maradona and Robinho were unhappy at Barca and Real respectively despite finding success regularly. Argentina coudn’t find much success in the 1982 World Cup despie spirited performances from Maradona. The same happened for Brazil with Robinho at the 2006 World Cup. One should wonder whether these similarities are just co-incidents or an indication of Robinho striking wonders with Man City in the coming years. Maradona was constantly supported by other new signings like Ciro Ferrara, Salvatore Bagni and Fernando De Napoli. At Man City, Robinho will also be looking for help from fellow Brazilians Elano and Joe as well as marksman Benjani. 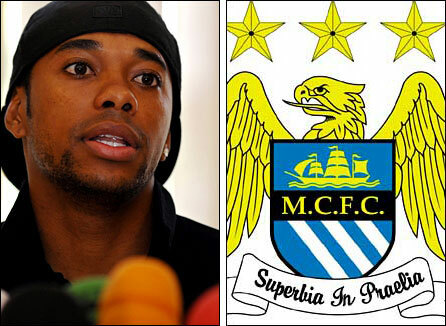 Fans should also hope that Robinho doesn’t face any cultural or language barriers at Manchester. For Maradona though, Italy was a second home because of his Italian ancestry.